Tall Poppies is delighted to present this third volume of Peter Sculthorpe's string quartets as a tribute to him on the occasion of his 80th birthday in April 2009. This recording was made in the Sydney City Recital Hall in Angel Place in December 2008. The four quartets presented here were written between 1998 and 2007, and present a showcase of Peter’s compositional interests, from close four-part harmony through to dramatic contemporary rhythms and on to melodies of love and anguish. The performances, as one would expect from musicians of this calibre, are exceptional, and Peter Sculthorpe, present throughout the recordings, is thrilled with the results. The third in a series of Goidner String Quartet recordings of pieces by Peter Scuithorpe, this CD covers works written from 1998 up to the present. 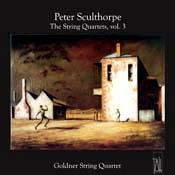 Considering why Sculthorpe occupies a place as Australia's best-known living composer, Roger Covell has pointed to Sculthorpe's "persistence with the principle of a single big idea: a deliberate, repeatedly emphasised identification of his music with Australian landscape in contrast with the imported European tradition". This is generally evident in the use of simple structures, the emphasis of particular melodic intervals, and a feeling of harmonic stasis. Sculthorpe's music is largely gestural, although he often writes melancholy melodies, recalling a pastoral upbringing in Tasmania. These elements run through the four quartets of this collection. The four quartets represented on this disc draw inspiration from a broad range of sources: the 14th, from the legend of an Aboriginal massacre occurring at Quamby Bluff, was later adapted as a piece for chamber orchestra; the 15th, on a sequence of songs by the people of the Simon mountains in Western New Guinea; the 16th, from the letters of refugees held in detention in Australia, and referencing Afghani music; and the 17th based on the theme of the fourth movement of Beethoven's last string quartet (also the 17th). Given such diverse influences, it is amazing how Sculthorpe can internalise those influences and still create pieces very much of his own voice. Melodies, when they appear usually rise up out of a gestural web to sneak into our perception - but they do not have an easy birth. A case in point is the third movement of the 16th, named Yearning. Although the melody is introduced by the lower instruments, yet incomplete, it is not until half-way through the movement that the violins take up the melody in a more obvious form. The result is quite surprising. Sculthorpe's melodic structures are often short and can be unsatisfying, easily subsumed within the background of gestures. When grouped together on a CD such as this, the commonalities between the pieces become evident, such as an over-use of the sliding glissandi harmonic 'seagull sound'. The 15th quartet draws elements from, without directly emulating, music of West Papua - the titles of the movements hint at tribal life - but also drawing on the rhythms of Australian Aboriginal music from the top end, and Balinese gamelan. The 16th quartet seeks to tap raw emotions found in the letters of asylum seekers held in Australian detention centres. Sculthorpe drew from a love song from central Afghanistan as a core influence. It is here that we hear Sculthorpe at his most angry and dissonant, but also in the deepest lamentation. Performances on the disc are sound. There is certainly contrast in the range of performance techniques, from aggressive and raw to pure and sweet. By ear, there are perhaps some liberties being taken especially by the first violin in the 17th quartet, but that would have to be confirmed by sighting the score. This is an interesting collection of pieces for string quartet demonstrating a unity of style yet crossing a broad range of influences - very enjoyable! "A unique and distinctive expression of loneliness, yearning and ferocious anger"
This third instalment in the Goldner's Sculthorpe series brings us to 2007, including the 14th (1998), the 15th (1999), the 16th (2005) and the 17th (2007), and it is surely a partnership made in heaven. The Goldners have a flawless technique, of course, but also a profound understanding of Sculthorpe's musical aims and vocabulary; there's always a sense of every element of each quartet being linked inextricably to the whole, even when quite disparate in character - for example, the almost terrifying quality of the second movement of No 14 ("In the Valley") immediately followed by the kind of sentimentality that appears in quotation marks (or does it?) of the third, "On High Hills". While such contrasts may be part and parcel of any composer's vocabulary, there's an organic quality about the music which is fully matched by that of the performances. The third volume of the Goldner Quartet's traversal of pre-eminent Australian composer Peter Sculthorpe's complete music for string quartet brings things right up to date, with four works from the last eleven years (two more quartets are in the pipeline, the booklet note promises). The music here is more direct and straightforward than the sometimes more abstract works of the earlier discs, and often has a story to tell. The Quartet no. 14 'Quamby', for instance, is based around memories of Sculthorpe's childhood in Tasmania, but also deals with the story of a massacre of native Tasmanians by settlers at Quamby Bluff. Quartet no. 16 was inspired by the hopes, fears and anger of asylum seekers in Australia's detention camps, in music ranging from a heart-rending Afghan love song (delivered eloquently by violinist Dene Olding) to some fiercely dissonant shrieks of despair. The Goldner players convey the drama of these works magnificently in playing that is committed, passionate and superbly controlled. Julian Smiles is particularly impressive in some of Quartet no. 4's rich, resonant cello lines. However, it's in Quartet no.17, a glowing homage to friendship based around the 'Es muss sein?' motto from Beethoven's last quartet, that the ensemble really shines, demonstrating some radiant, expressive playing in music of great subtlety and depth. Recorded sound is clear and warm, although there's a slight ambient hiss in the background throughout. The Goldner String Quartet rnagnificently evokes Peter Sculthorpe’s sound world from the very first to last bars on this CD. Indeed, this is playing of the highest order and Graeme Skinner’s excellent annotations are a real bonus. The disc celebrates the composer’s 80th birthday in 2009 and includes his latest string quartets, Nos I4-17. Hats off to all concerned. Peter Sculthorpe, the Goldners, the Browne family who funded the CD in memory of Lindsay Browne, an arts/music reviewer par excellence and Tall Poppies for having the vision to record all the Sculthorpe string quartets. These are fine works beautifully played. Go out and buy! Goldner String Quartet’s project to record all the quartets by Peter Sculthorpe is brought up to date in this third instalment, covering 1998 to the present, There are four works, String Quartets No. 14-17, and all are recorded here for the first time, One hears a composer who has found his most natural voice in the string quartet medium. These later quartets have a distilled character: textures are cleanly formed and melodies are tunefully simple, at times impassioned. Big sociopolitical themes sparked these works. Quartet No, 14 (Quamby) is Sculthorpe’s response to folkloric stories from the 19th century about the massacre of Aborigines in northern Tasmania. It broils with intensified emotion. The more prayerful Quartet No, 15 laments the dispersal of the Simori people from their homeland in New Guinea. Haunting and anguished, Quartet No, 16 was triggered by the plight of asylum-seekers in Australian detention centres. Composed in 2007, the more abstract Quartet No, 17 is the most satisfying of the four. Quoting a theme of Beethoven, it has an expansiveness and musical complexity that seems to open the door on the composer’s inner self. Flowing, unforced musicianship from the Goldner players allows them to unlock fully the spirit of this music. Their playing is eloquent, human-faced and expressive. Peter Sculthorpe celebrated his 80th birthday in April, and this recording of his four most recent numbered string quartets was released to mark the occasion. He has been the leading Australian composer of his generation; his works manage to evoke his country's extraordinary landscapes while never shrinking from its social issues. So the 14th Quartet is subtitled Quamby, and evokes not only the Tasmania in which Sculthorpe grew up, but also its brutal colonial past: it identifies a place where Aborigines were massacred. The 15th looks across the Torres Strait to New Guinea, incorporating song sequences and scales from a local tribe; the 16th is designed as an appeal for justice for Australia's asylum seekers; the 17th is more personal, and incorporates the motto from the last of Beethoven's 17 quartets, Op 135. Yet the soundworld of all these works is identifiably Sculthorpe's own, with its highly wrought, often densely chordal string writing lit up by sudden scatters of harmonics, like cascades of birdsong, and all superbly delivered by the Goldner Quartet. Amidst all the hoopla for Handel and Haydn in this anniversary year, it’s easy to forget that Australia’s own Peter Sculthorpe has turned 80. This latest instalment in the survey of his quartets comprises the last four works of this genre. Written in the space of just over a decade, the breadth of Sculthorpe’s creativity is matched by the depth of his passion for the landscapes, musical styles, friendships and social issues that influenced him. Whether it be the terrain of his native Tasmania (now devoid of indigenous inhabitants), the dispersed Simori of Western New Guinea or the detained asylum seekers in our own country, Sculthorpe uses his genius to evoke and celebrate the human spirit in the midst of a contrary world. The Goldner Quartet, seasoned exponents of Sculthorpe’s work, gives thoroughly engaging accounts of Quartets 14-17. Recorded in the presence of the composer this is superb Australian art that no music lover should be without. Somewhat belatedly, one of the Goldner String Quartet's Sculthorpe series, celebrating Peter Sculthorpe's 80th birthday last month, has been received for review. It comprises the the prolific composer's last four quartets (1998-2007) of the seventeen to date (two more are commissioned). All of them have a strong basis in his pursuit of 'an identifiably Australian idiom'; in 1967 he said "I never want to hear another note of Beethoven in my life!". However, No. 17 is based, quite transparently and openly, on the famous "Must it be? It must be!" motif from Op. 95, and makes a good culmination to this album. The others have more exoticisms, reflecting Tasmania's landscape and history, e.g. songs from Western New Guinea in No. 15 etc (No. 8 - of which a movement was given in the Goldners' 2007 Wigmore Hall recital reviewed above is Balinese-inspired). This is a terrific sequence which we played right through with consistent interest and pleasure. I remember enjoying Sculthorpe's music several decades ago, but he is not often heard in UK now. I would think that the full cycle of his quartets to be given by the Goldners would be welcome in London, rather akin to my like recommendation of Murray Schafer's seven. The first seventeen of Sculthorpe's quartets are available in well presented Tall Poppies releases, each with expansive analytic essays and evocative cover images of paintings by his "friend and mentor" Russell Drysdale.